Claud Hatcher of Columbus, Georgia, sold a lot of Coca-Cola through his grocery business and felt he was entitled to a discount. Not receiving one, Hatcher declared he had purchased his last case of Coca-Cola and vowed to develop his own brand. He started with Royal Crown Ginger Ale in 1905 followed by Chero-Cola, a cherry-flavored cola, in 1910. This new flavor became so popular, Hatcher changed the name of the company from Union Bottling Works to Chero-Cola Company. Chero-Cola’s popularity helped the company expand throughout the Southeast with franchise bottling plants including one in Greensboro which supplied Morgan County. 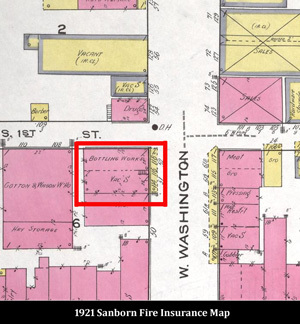 The owners, L. E. Wright and G. A. Moore, moved their operation to Madison in 1914 installing “$6,000 [ worth of] modern up-to-date equipment” in the Swords Building at the corner of Washington and First Streets. 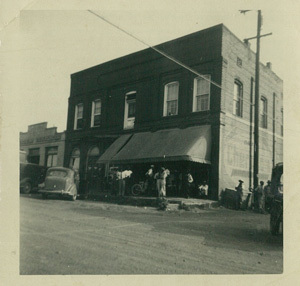 Trade in Morgan County had “assumed such proportions that the plant found it necessary to move here in order to fill orders.” The Madison bottling works supplied Morgan, Greene, and Taliaferro counties. Locating the bottling plant in the Swords building had a certain symmetry that mirrored legislative and social changes in Southern society. J.B. Swords was a distiller of whiskey and ran a saloon in the building in the 1890s (see our blog about that era of the building). However, the temperance movement was strong in Georgia resulting in ever increasing prohibition laws: a "local option" law in 1885 that allowed residents to vote their individual counties dry through a referendum, a 1907 statewide prohibition with some big loopholes, and finally an even stronger statewide prohibition in 1915. This aided the growth of soft drinks which were sometimes referred to as “temperance drinks.” Hence, an 1890s saloon became a 1910s soft drink bottling plant. 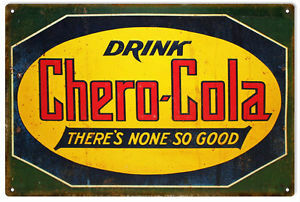 Chero-Cola’s ads stressed that the drink was only sold in bottles, focusing on “uniformity of flavor” and “certainty of cleanliness.” Even after 1915 when W. E. Black of Conyers purchased the Madison operation, the sanitary nature of Chero-Cola’s operation continued to be a selling point. 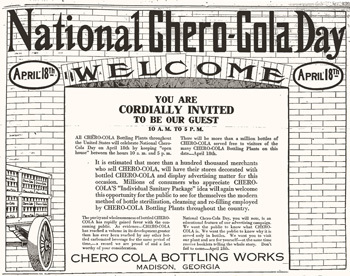 So much so that the company held National Chero-Cola Day on April 18, 1917 when all their bottling plants throughout the United States hosted an open house. He re in Madison, each visitor was greeted with a pretty fan, a booklet, a flag lapel pin, and a bottle of Chero-Cola. Attendees were shown how bottles were soaked in salt water, washed, and rinsed by machinery insuring no foreign substance could get in the bottled product. The Madisonian reported that there was no trash or dust about the place and that it was “as neat and clean as a parlor.” Mr. Black gave away 6,500 bottles of soda that day. With sales continuing to grow, Mr. Black purchased the lot next to Godfrey’s in 1919 planning to build a 40 x 140 brick building for a new bottling plant. File this under “never built” as Black retired shortly thereafter handing the reins to W. F. Beam. Beam doubled the capacity of the plant within a couple of months. Despite this, Beam decided to relocate and sold the operation to L. C. Boochever and Eddie Cohen. By 1920, the plant was filling 1,200,000 bottles annually. Something then went terribly wrong. With little explanation, a December 30, 1921 Madisonian article announced the sale of all the bottles, crates and machinery of the local Chero-Cola plant. A bankruptcy notice followed in February. The national company was facing difficulty as well. Chero-Cola was forced to drop the word “cola” from its name in 1923 after a years-long challenge from Coca-Cola. While the decision was eventually reversed, and the company reintroduced a cola product, minus cherry flavoring, Royal Crown Cola, the name Chero-Cola disappeared. Madison Moments, a weekly blog highlighting Madison's rich history, is a creation of the Madison Historic Preservation Commission. This volunteer board protects the community's wealth of historic resources - most notably the Madison Historic District, first listed in the National Register of Historic Places in 1974.